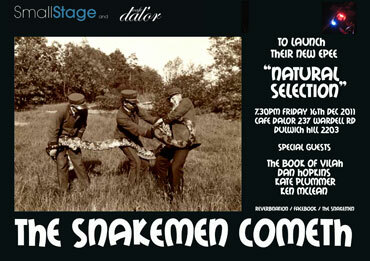 The Snakemen, Craig Edmondson & Stefano Cosentino are two lo-fi song smiths from Sydneys south. They take their name from the snake men who performed reptile shows out at La Perouse. Their shtick is the rich vien of of Sydneys forgotten characters that just like snakes can only be found if they want you to find them. Their new Epee "Natural Selection" features five history songs such as "History for Dummies" re Archduke Franz Ferdinand, & "The Day the Greycliffe went down" re the great 1927 ferry disaster in Watsons Bay with forty lost lives, and various other heritage folk gems & stories from places like Kings Cross & Darlinghurst. A great line up of guest artists supports them in what promises to be a true night of great entertainment. The Book Of Vilah are an original 4 piece acoustic band from Sydney. Their music comes from various cultural & creative backgrounds & floats on the edge of many styles. The full performance consists of Vilah (Alex Sideratos) telling his story in the form of a dramatic monologue set in a jail cell in 16th century Greece. 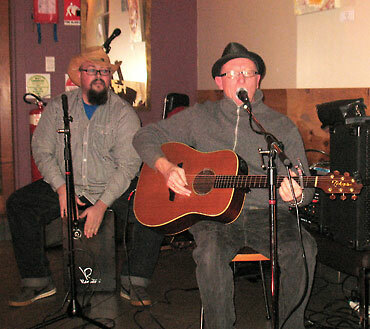 Café Dalor Open Mic has been running for nine months now meeting on first & third Fridays of each month providing a relaxed stage for mixed performance styles, wide age range with high degrees of musical experience. Cosy, intimate atmosphere with courtyard ideal for folksinger songwriters, soft blues etc. 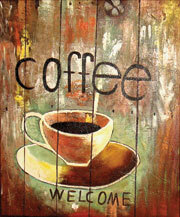 Great coffee, good food, BYO wine & beer etc. PA Supplied. 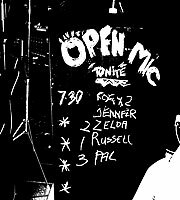 *Cafe Dalor Open Mic is on 1st & 3rd Fridays but is closed in January 2012"
All welcome. Come along and enjoy this cosy new venue.